Typhoon trauma victims, including witnesses and first responders, can find comfort by confiding painful emotions once survival threats have passed. 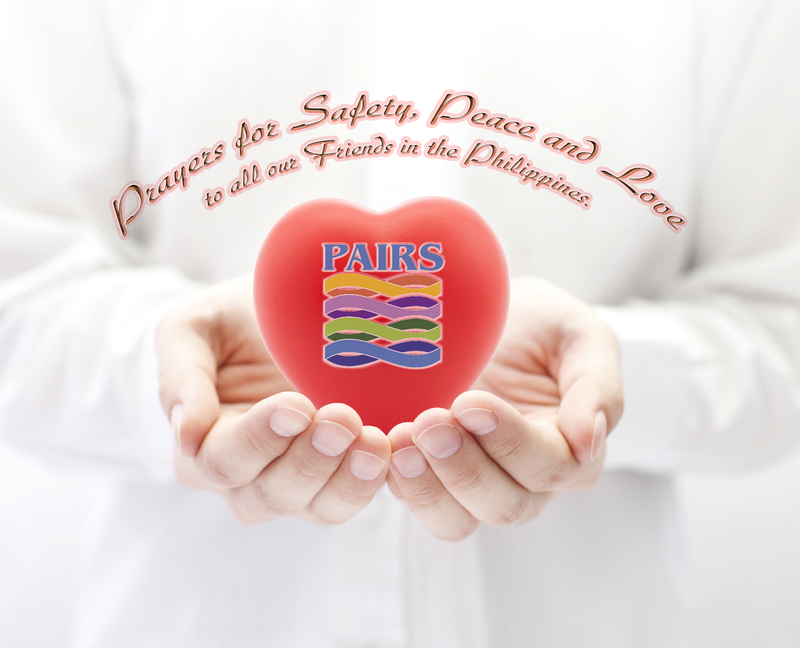 This week, PAIRS Foundation will contribute to a recognized charitable relief organization providing help to the people of the Philippines for each person in the Philippines who let’s us know they’ve completed the exercise shown at the end of this article. While nothing erases the memory of fear and loss, confiding those feelings aloud to a loved one, trusted friend or colleague can begin to bring a sense of relief, help trauma victims think more clearly, and start the process of emotional recovery. It’s important to recognize that painful feelings don’t have to make sense, be explained or rationalized; but they do need to be expressed. The impact of upsetting feelings is exponentially greater when held in and eventually either implode, causing constant sadness and potentially, depression, or explode, often towards the people we most love. None of us choose what we feel. We feel tingling, waves or, at times, even hijacked by emotions in our bodies before our mind is aware of them. The feelings we have, and their level of energy, are unique to each of us, influenced by a lifetime of experiences and, as science is exploring, perhaps even those of our ancestors woven into the fabric of our DNA. Click image to access exercise for helping Typhoon trauma victims begin journey of emotional healing and recovery after survival threats have passed. Understanding that we don’t choose what we feel is important to being responsible for what we do with the feelings we have. As adults, we can choose ways to relieve upsetting feelings so we don’t become lifetime prisoners to the most painful events of our lives. Being able to confide emotions such as anger, sadness, and fear requires someone who can listen with empathy (a sense of what it’s like to have those feelings), without asking questions, offering solutions (unless asked), comparing, judging, criticizing, distracting or otherwise dismissing the feelings. So often, once threats to survival have passed, efforts to try to fix the pain of others instead of just listening is the opposite of what’s needed. Those types of responses, which may seem natural and are surely well-intended, can end up causing trauma victims to filter what’s shared, pretend outwardly that everything is “okay,” and lock painful feelings inside, along with all the energy they contain and often continue to build up. Once survival threats have passed, it’s vitally important for trauma victims, including first responders, to confide in someone with whom it’s safe to be vulnerable. The role of the listener is a critical factor in process. One of the most important aspects of PAIRS training is teaching people to be good listeners. Anyone helping a loved one, friend or colleague through trauma should take a few moments to check what it means to be a good listener here before beginning. Afterwards, an exercise known as Emptying the Emotional Jug, available online, gives a structure for trauma victims to begin the journey of emotional healing and recovery. For each person in the Philippines who let’s us know they’ve done this exercise this week, PAIRS Foundation will contribute to a recognized charitable relief organization serving in the Philippines. Seth Eisenberg is President/CEO of the nonprofit PAIRS Foundation, a longtime industry leader in relationship skills training that has been widely recognized as a Best Practice for helping marriages and families.